Discover the gift of giving back. For every watch sold, we provide a clean water supply for one person in the developing world, for their entire lifetime. Use the code: DISCOVER25 for your $25 gift credit at checkout! Every Water timepiece is made of the finest raw materials and because of our dedication to quality craftsmanship, we guarantee every Water product has been created with the utmost care. Just .63 cents helps provide 1 year of clean water for one person in the developing world. With every watch sold, Water Watch Company helps give clean water to someone who needs it, for their entire lifetime. Pair your watch with a Water Cuff Bracelet or an extra strap to create endless combinations. With GPS tracking and site monitoring provided by our charity partners, we can share with you where we've helped give clean water. We will be issuing quarterly impact statements on our website and newsletters with details about: where, when, who and how, your purchase has made an impact. Our first issue is planned for January 2019. We've partnered with the most transparent charities working to solve the water crisis. Their work involves drilling wells, purifying water and piping clean water supplies to community taps all over the world. Water products are made with a level of care that you can see and feel. We are confident in the quality and craftsmanship of our watches. 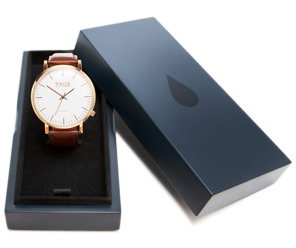 Each Water timepiece is backed by a five year warranty, and if you are not absolutely thrilled when you receive your item, we offer free 30 day returns.